SwiftPrez is a PowerPoint solution for medium to large-sized businesses with a need to keep presentations on brand whilst saving oodles of time for employees creating presentations. With many organisations projecting their brand to the market through the presentation medium, SwiftPrez helps make that experience more efficient, professional and enjoyable for both presentation authors and their audiences, often your customers and prospects. Provide access to the presentation content you spent so much time and money on developing, in a smarter way. Use the rules engine to automatically correct brand inconsistencies or allow the user to manually correct/ignore them. Link to your preferred web or file resource for educating users on creating on-brand content. SwiftPrez includes a smart Brand Assets Library feature for sharing all the cool content your company has created, in a smarter way than just sending presentations to employees or storing them on a server somewhere. Your colleagues no longer need to remember what that elusive slide is or where to find that great picture they saw in a presentation many moons ago. 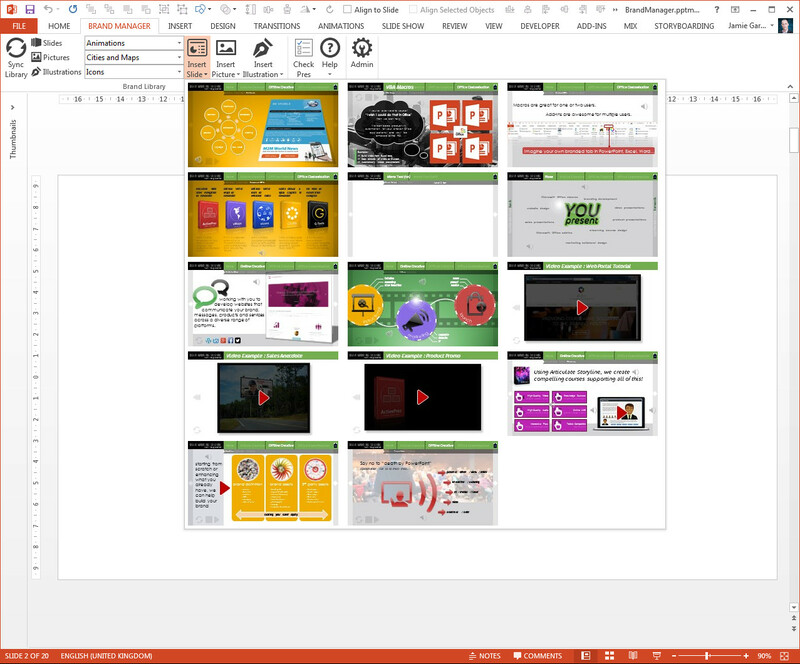 Slides, pictures, icons, illustrations and more can all be access directly from the PowerPoint ribbon. 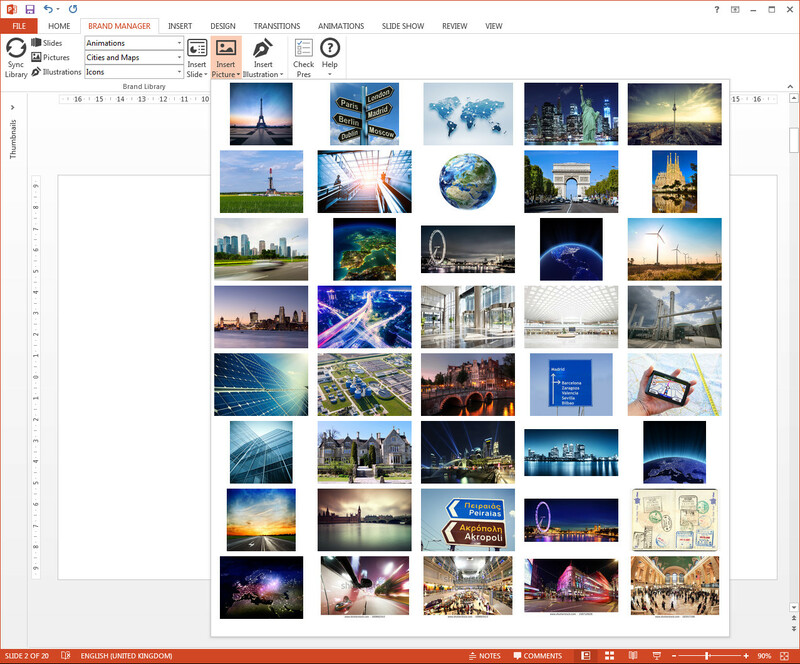 The new SwiftPrez tab (customisable to your own brand) provides access to all of the brand assets you decide to share with your PowerPoint colleagues. Share any number of slides from any number of presentations in any number of your own categories. Share any number of pictures from your brand’s stock library in any number of your own categories. 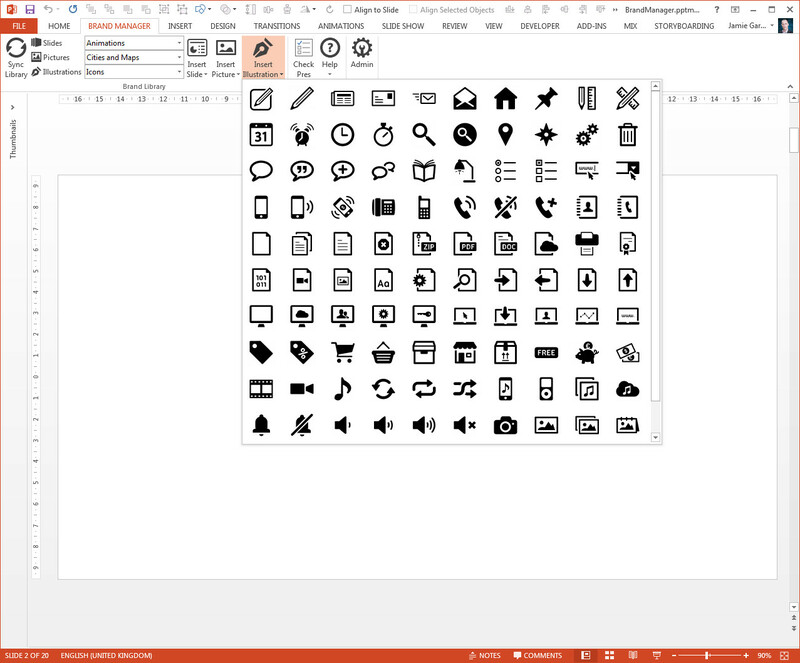 Share icons, shapes, groups, tables, charts and any other PowerPoint objects in any number of your own categories. All of the above is provided without your colleagues every having to manually open a presentation, browser, or Windows file explorer ever again! As the content manager, you can add new content to your organisation’s library simply by dragging it into the corresponding folder on your file server. Because SwiftPrez uses its sync engine to create a local mirror of the brand asset library, your colleagues can work smarter both in and out of the office, in the air and if they really want to, by the pool. SwiftPrez comes complete with a highly configurable rules engine which we or your chosen solution administrator can set up in accordance with your brand guide. The rules engine can be configured to run automatically whenever a user saves a presentation or they can run the checks manually. *Each has a separate rule for different on-slide objects such as title and subtitle placeholders, shapes, text boxes, tables and SmartArt. We all know that the only constant in life is change so should you change your mind about which rules are run and how, no problem, we’ve got it covered. 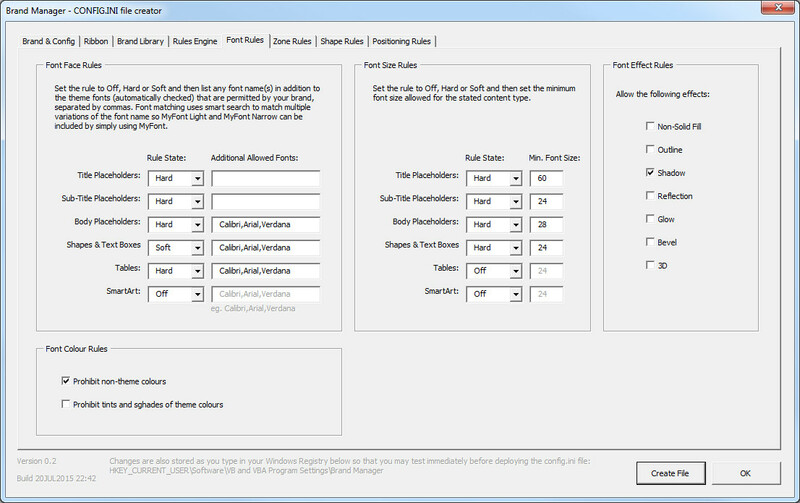 SwiftPrez can be configured to install all of your rule preferences on day one. Should those change at any time in the future, we or your content administrator can reconfigure the rules engine with our easy-to-use tool and push the changes out to connected users. SwiftPrez is not currently compatible with PowerPoint:mac 2016 but stay tuned! SwiftPrez is highly configurable out-of-the-box but let’s say you have a need to do something in PowerPoint that can’t be done today, we’re here to help. Give the user the option to automatically insert pre-formatted text in a format of your choice, for example, presentation title, location, presenter, date. Let’s say you have a need to add frequent ‘stamps’ such confidential, internal use only etc. We could add a button to the ribbon providing users with a way to do that in a single click. Need to export your slide notes to Excel, your slide images to an Outlook email or charts from Excel to PowerPoint? we can do it all. If there is anything repetitive that you and your users do manually, frequently, we can fully automate it for you, often with a single click of a button. No two clients are the same so we offer a service to develop extensions to SwiftPrez (or develop a completely separate solution based on your precise needs). Use the contact form below to let us know what you’d like to do and we’ll be happy to help.